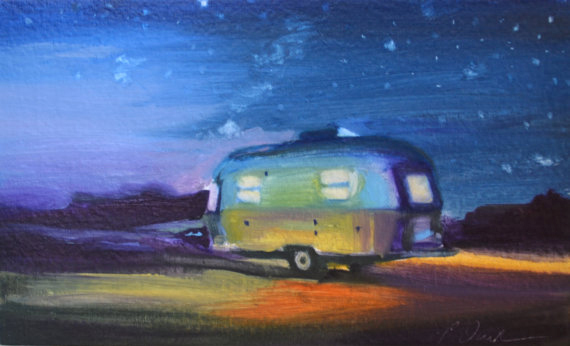 Playful Paintings of Simple Pleasures & Grand Places in Life. Humorous & Happy Cards Whimsically Watercolored by Hand. Painting as an artistic technique can be very much like dancing. Your hand leads a brush in movement across the canvas, following the rhythm of a vision you have in your mind. You use a mix of short and long strokes to create visual harmony and convey emotion. For me, painting is as enjoyable to watch as the finished product is to admire afterwards. When I look at the work of Texas painter and illustrator Paige Davidson, I see this dance in action, and that is one of the many reasons why I greatly enjoy her talent! There is a lot of whimsy in her strokes and subject matter. While her primary focus is oil painting, she also has a knack for watercolor and illustration. The technique behind each of these mediums is somewhat different, but Paige’s characteristic style shines through no matter the finished product. There is a softness to her painting that’s almost soothing, even when she’s featuring a dinosaur. The other common subjects in her oil paintings range form sweet laden still lives to nostalgic landscapes graced by an airstream trailer. For her notecards, she often depicts common themes like Love, Thanks, Congratulations and the Extraordinary in the Ordinary. Each of Paige's cards are one-of-a-kind because she hand illustrates and watercolors them one at a time. You can tell it's her work not just from her style of painting, but also from her sense of humor. She is great at coming up with designs to appeal to a wide range of possible customers, taking into account what’s unique about each market she visits. She has a set of "classic pairings" that I love - Beer & Pizza, Cookie & Milk, Bacon & Egg, Ketchup & Fries etc. At the show she came to in Austin this summer, she also made sure to include plenty of options with icons from our city like breakfast tacos and queso! Humor, Whimsy and Talent are a powerful combination! I’m so glad Paige shares these with us through her art.